Multi-Channel – Play the DSD multi-channel surround audio layer. Stereo – Play the 2-channel DSD stereo audio layer. CD Mode – Play the 2 channel PCM CD layer of a hybrid SACD disc. On – If the disc contains Play Back Control, show the menu. Off – Play back the contents by sequence. disc being properly rated and encoded. Press the Enter button to bring up the rating selection menu. password yet, the default password is “0000”. and any rating below the selected age will be blocked. above will be blocked. If “Off” is selected, all discs are allowed to play. supports the parental control ratings used in the United Kingdom. is available, that menu will be shown instead of the default disc menu. the disc, the Audio track will be played back. Subtitle Language – To choose the preferred subtitle language for DVD. later section of this manual. Cambridge Audio is known as distributer selling different stuff related to car audio and video. In our library we have 85 original userguides of this brand . 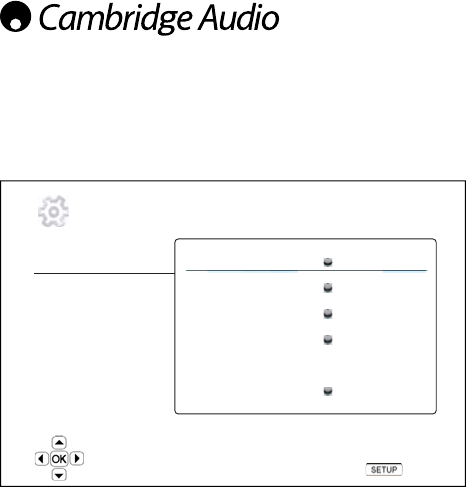 Now you're reading a user guide for Cambridge Audio Blu-ray Player AP26149/1.